Remember back on day two when I said how relaxed I was about packing up my gear in the morning? And how nice it was to not feel like you’d be left behind by your group? Well, today I got started at 8:30am. No more am I hanging out relaxing in the morning. While there’s no pressure from a group to get going, there’s a bit of pressure after realizing that all of my camping options are on a first come first serve basis. With everything being booked and full, I have a sense that I need to get moving fast, and arrive at my destination, wherever that may be, early. And in fact, I’m feeling like I should have left even earlier than this today. 8am is now a late start in my mind. Speaking of destination, wherever that may be. Where exactly am I heading you ask? Well, I had done some research before this trip, with the thought that I may head all the way back to Seattle and get home to Portland via Amtrak ride. The problem was that there just wasn’t enough time to hit the entire west coast of Washington AND make it back to Seattle. However, since the coast was not a viable option anymore, I tentatively decided to head toward Seattle, and see if I could make the Amtrak ride back to Portland work. Though I hadn’t worked out all the details of each day yet, I could see on the map that it was a possibility. 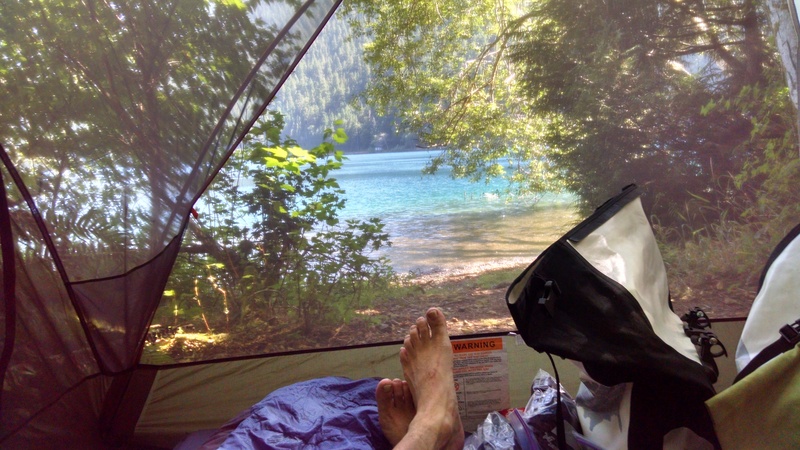 So I worked out this day 7 trek that would take me to the Lake Crescent campground, a first come first serve site. Also, this new trajectory would take me through many parts of the most awesomely marketed Olympic Discovery Trail (ODT). 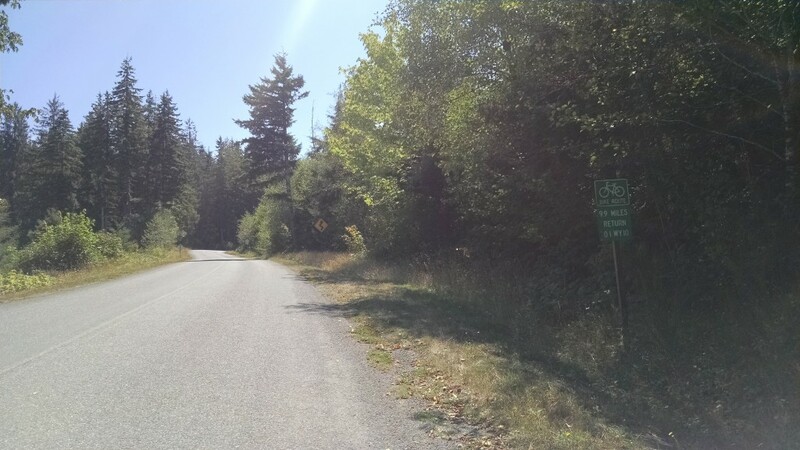 While much of the trail is not trail at all, but highways and side roads, there is a good amount of actual trails. So my tentative direction and course has been set when I wake up today, just not all the specifics. 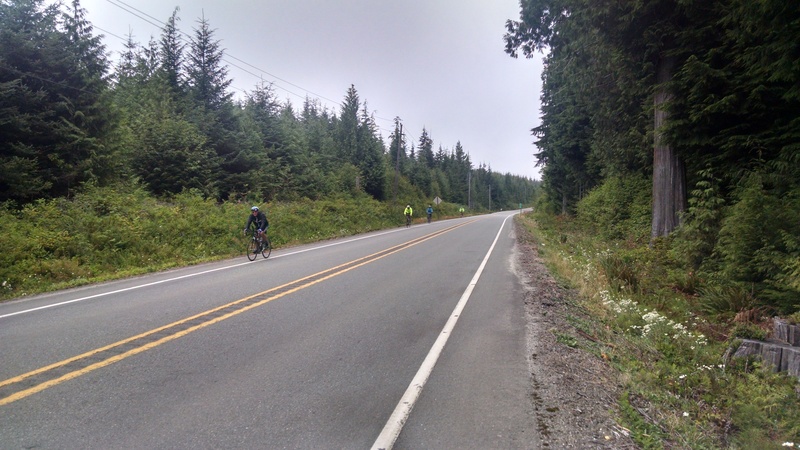 Yesterday, the woman working at the Kalaloch Lodge market said there were supposed to be about 250 bicycle riders coming through today, on the 7th. And the moment I came out of Hoh Oxbow, I start to see these riders streaming by. And most of them were saying hello from across the highway. 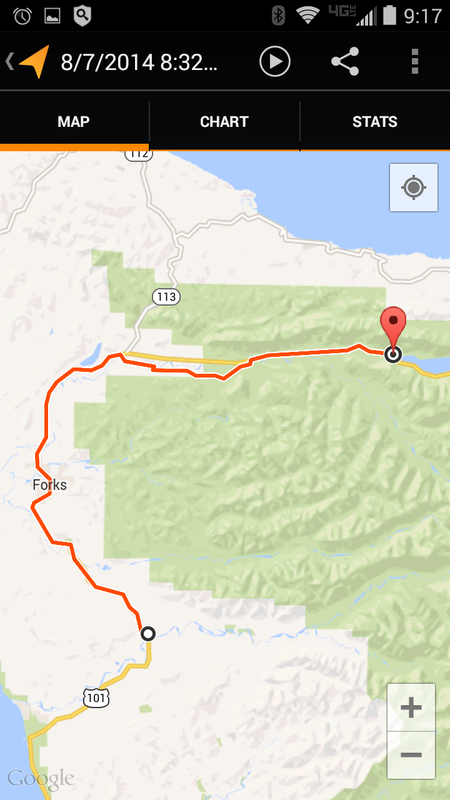 It’s about 14 miles to Forks, where I stop for breakfast and to charge my phone and batteries. Note the twilight poster in the window of the welcome center. And there are at least two stores specifically catering to twilight fans. 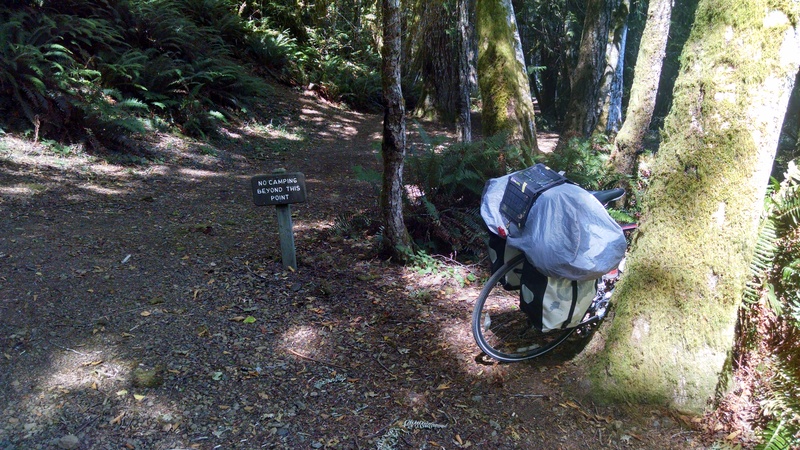 It’s another 13 or so miles before I reach the first non highway section of the Olympic Discovery Trail (ODT). Today was a fairly quick ride, as I was pretty set on getting to my destination in time to actually get a camp site that is first come first serve. I knew there was a chance I’d be scrambling. And I was so happy to arrive at Lake Crescent. This would be night number three without a shower, but the lake was just so inviting and awesome to jump into that the shower was not so missed. The final downhill before coming to this campground was really fast! 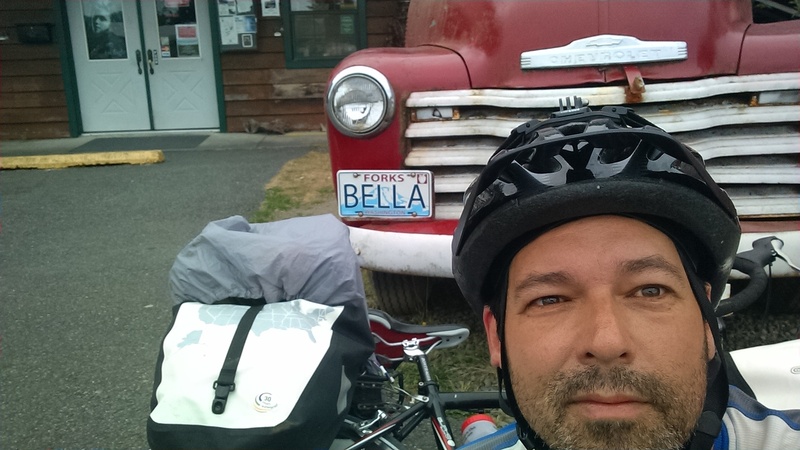 By this time I was used to the heavy weight of my fully loaded bicycle, so I was able to comfortably get up 40 miles per hour on the final downhill into Lake Crescent campground. Though it was a little nerve racking to merge into traffic at the bottom of the hill to turn left into the campground. I walked into the walk-in camping area to find that pretty much every single site was taken. I ended up pitching my tent on the edge of an official site on the other side of a log but on this side of the “no camping beyond this point” sign. I don’t think I was legitimate at all, but I thought maybe i’d get away with it if nobody looked too close. Not too long after I bathed in the lake, I took a little hike up the steep embankment behind the tent, to discover an official walk-in site that was completely vacant, and absolutely one of the best sites in the entire area. The reason it was not taken was that the site leading into it had such an over sized tent that it was concealing the path to this hidden gem of a site. So I quickly migrated my stuff to the site (#71) to become official. 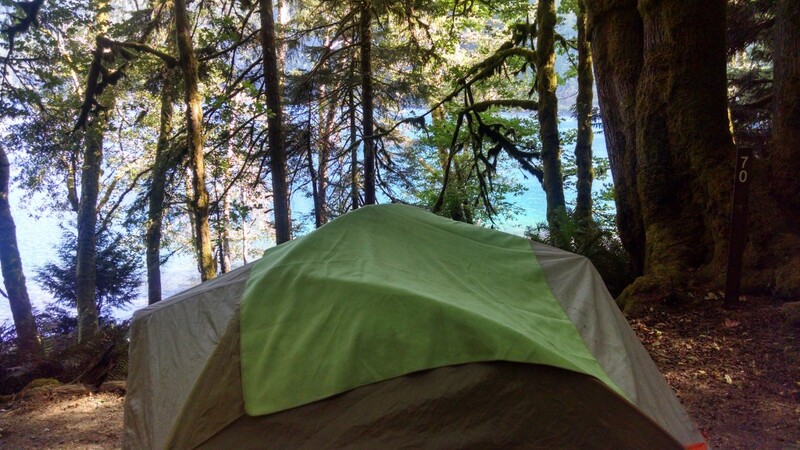 As it turns out, the original place where I had pitched the tent was right next to a family with three really loud young children, and I was thankful for having moved my tent, and for having the option to do so. Seriously, I don’t know how I got so lucky to get this spot when everywhere else was taken. One thing to note about this camping area is that the walk-in sites are not reserved for people without cars. So don’t assume you’re only competing for these sites with other back backers and bike packers. People can park their cars in a lot only a hundred feet away and walk right into these awesomely placed sites. So they are obviously quickly filled. Also, in the future, it is advisable to first go to the pay station at this camp site before wandering around looking for a randomly open site. Because there is a checkerboard signup place that may show you pretty quickly which sites are available. This can help you quickly get to such a site before someone else does. 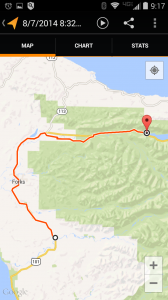 For the raw GPS map of today’s ride, click here.